Element Data is harnessing the power of machine learning and technology to build a framework that helps people make choices — whether it’s what car to buy, what marketing strategy to set out or what city to move to. Charles Davis has barely stepped outside of his small San Francisco lab space in the last month. His mind is so full of bits of code and musings on human behavior that the bright lights in the Seattle coffee shop he sat in this week seemed to almost shock him. Davis has spent the past two years developing a system that he first started working on nearly 20 years ago, when he realized how many people wanted help making decisions. He and his Seattle startup Element Data are harnessing the power of machine learning and technology to build a framework that helps people make choices — whether it’s what car to buy, what marketing strategy to follow, or what city to move to. 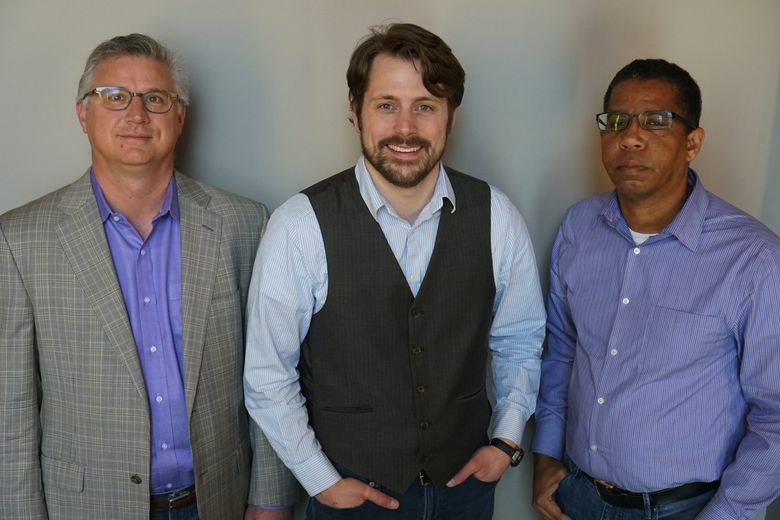 The eight-person startup closed a $1.7 million seed funding round this week and also bought another Seattle company, PV Cube, to expand its understanding of engineering and cognitive behavior. Element Data was founded by Davis, along with Cyrus Krohn, a Microsoft alum who was publisher of Slate, and entrepreneur Geoff McDonald. The team raised its first round of funding from big-name angel investors including former Morgan Stanley executive Archibald Cox Jr. and former Amazon executive Stephen Lawler. Davis, who lives in San Francisco, was previously an executive at Wells Fargo, where he led a behavioral-sciences division. He later founded a gaming company that eventually became part of Electronic Arts, and went on to start three more technology companies, which were acquired. Element Data’s software, which is still being developed, is a bit like a “pro/con list on steroids,” Davis said. It allows people to enter various options for a decision they are considering, along with criteria that are important to them. The system, known as Decision Insight Computation Engine (DICE), then pulls information about each option and eventually turns out a report that gives a recommendation of the best choice. Element Data will invite users to a limited release of its software later this summer. Eventually, the company plans to make money from the service by selling advertising space and aggregated data to companies. One of the first things it will be able to analyze is car-buying decisions. Davis and the team are teaching DICE everything it needs to know about different makes and models of cars. Then, when someone enters the vehicles they are considering and which factors are important to them (maybe safety, appearance, size), the system will be able to look at all the data and suggest a model. The system also considers “irrational” criteria, or factors that cannot be quantified but are still important to the person making the decision — the “sportiness” of a car, for example. The machine might not know what “sporty” means, but it can tell how important it is to the consumer. It has become more common within businesses to use artificial intelligence technology like DICE, which learns information over time and can process large amounts of information quickly. But many companies are struggling with the right balance of human and machine decision-making, according to the Harvard Business Review. The question has continually come up: How much power do you give to artificial intelligence machines to make decisions? Element Data’ssystem is different in that it lets users enter their own options and criteria, giving them all the power, Davis said. “Once you have this information broken out and we give you a format to put it in, we see why you’re doing something, and what builds confidence in you,” he said. As the system learns more about each user and how each one makes decisions, it will get better at making choices, Davis said. He was surprised when the early framework he made nearly two decades ago — a stand-alone application that was originally intended for car buyers — was being used to make decisions about everything from medical treatments to college selection. That’s when he realized he had stumbled onto something interesting. People always want verification that they’re making a good choice. Davis’ wife, Rosemary, used the system for the first time years ago when she was trying to decide where to do her medical residency. She had so many factors to consider: what city she should move to, which program would have the most impact, which area had good schools for their kids. Stressed, she decided to give Davis’ project a try. She put in 27 criteria, and the machine considered all the information and spit out a suggestion: Einstein Medical Center in Philadelphia, where she ultimately went.